Apparently, the sporadic freeze-frost events that occurred this spring in southwest and central Ohio caused little damage to maple flowers and developing seed. Almost all species of maples in those parts of the state are festooned with heavy seed (a.k.a. "helicopter seed," "maple spinners,"). 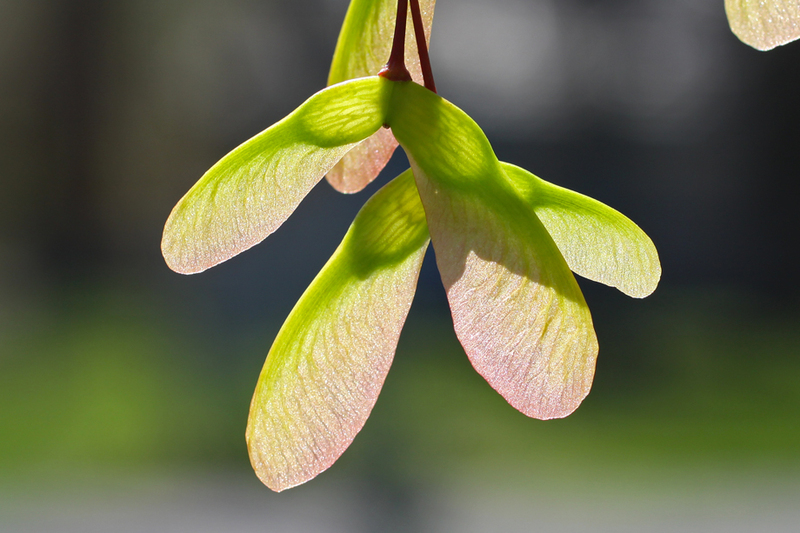 Abundant winged maple seeds (samaras) in the spring can draw both the attention and wrath of landscapers and homeowners. Trees shift energy to support heavy seed production at the expense of leaf expansion which makes "seedy trees" look unhealthy. The overall sickly appearance is enhanced once seeds mature and turn brown. Of course, once the seeds drop, the resulting maple seedlings become a serious weed issue as they sprout throughout landscapes and in uncovered building gutters. It was once believed that prolific maple seed production is connected to tree stress; the theory was that heavy seed production occurred on stressed or dying trees as a last hurrah in support of the species. It was eventually discovered that maples are by nature heavy seed producers; however, the successful persistence of the seed to maturity depends upon whether or not the flowers or nascent seed is exposed to freezing temperatures.